Wednesday, January 20, at 5:30pm in Alumni Hall in Randolph Hall at the College of Charleston. 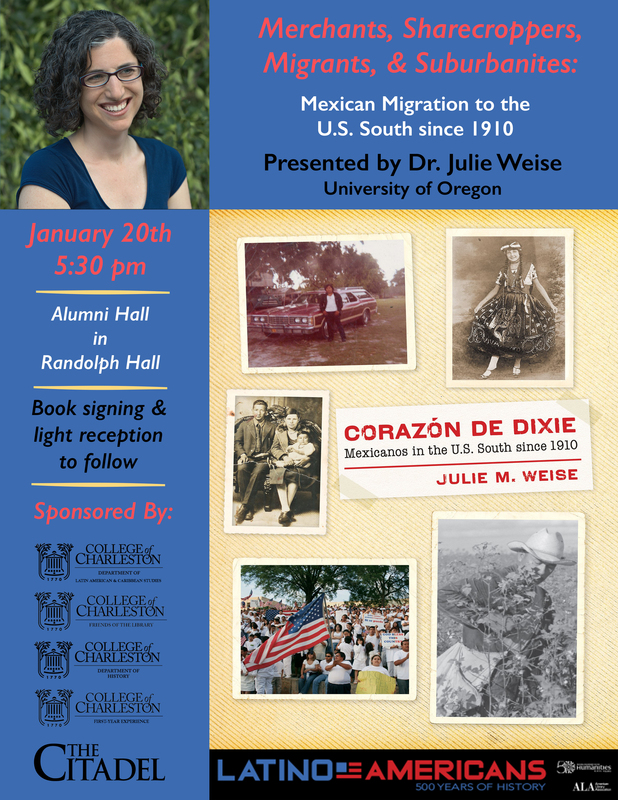 Dr. Julie Weise of the University of Oregon will talk about her recent book, Corazón de Dixie Mexicanos in the U.S. South since 1910 (UNC Press, 2015). Corazón de Dixie recounts the untold histories of Mexicanos’ migrations to New Orleans, Mississippi, Arkansas, Georgia, and North Carolina as far back as 1910. It follows Mexicanos into the heart of Dixie, where they navigated the Jim Crow system, cultivated community in the cotton fields, purposefully appealed for help to the Mexican government, shaped the southern conservative imagination in the wake of the civil rights movement, and embraced their own version of suburban living at the turn of the twenty-first century. Rooted in U.S. and Mexican archival research, oral history interviews, and family photographs, Corazón de Dixie unearths not just the facts of Mexicanos’ long-standing presence in the U.S. South but also their own expectations, strategies, and dreams. A book signing and light reception will follow. Julie M. Weise is assistant professor of history at the University of Oregon. Learn more about the author and her work here. This event is supported by the College of Charleston Department of Latin American and Caribbean Studies, Friends of the Library, Department of History, First-Year Experience, and The Citadel.